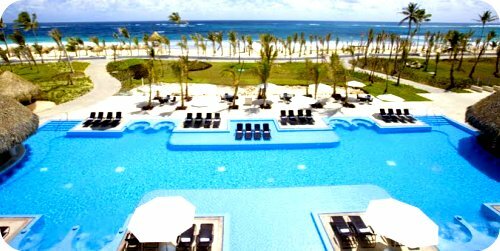 Pretty soon you'll be able to literally rock the all-inclusive, with the opening of the 1,700+ room Hard Rock Hotel All-inclusive in Punta Cana, Dominican Republic. Just when you thought there wasn't any more room for another all-inclusive on the white sand and azul shores of the Dominican Republic, Hard Rock Hotels undertakes a MASSIVE project. Set to soft-open November 1st---maybe my invite's still in the mail?---this swimming pool-jammed monolith will rock 121 acres of the existing Palace Resort with the complete transition expected by spring 2011. And if you think this excuse to party like a rock star is only for adults (that was my assumption at first), think again; kids are not only allowed, they are catered to with water slides and mini golf. For adults, in case rocking out to tunes all day long and gazing at rock star memorabilia isn't your thing, there's a Rock Spa or Jack Nicklaus golf couse. Then again, if you're entertaining the thought of going to the Hard Rock's first all-inclusive, then features like theme clubs and lounges, photobooths, live performances and the Caribbean's largest Vegas-style casino will probably suit your fancy. Trip Styler Tip: It's basically implied that the non-intrusive renovations will be taking place from Nov 1, 2010 to spring 2011, so if you're looking for a 5-star, reduced-rate all-inclusive, this transitioning property might be a good bet.